we're sure you'll find what you're looking for with Clever Apple. Epic battle of good vs. evil. Every crocheter has scrap yarn. Little balls of yarn left over from other projects that seem to have little use. Well... we have a scrap buster pattern in this issue to help you use up those little balls of yarn. Check out the Member Patterns ! We share links to free patterns from time to time... don't miss out! and you might see it here! >I had this pattern yeara ago and now cannot find it. >>Have the instructions for the Herrschners Indian Lore Afghan but no picture. I would like to know what it looks like before I buy all the yarn. Could the Indian Tears pattern you mention be the "Apache Tears" pattern? “You are not what others think you are. "For God so loved the world, that He gave His only begotten Son, that whoever believes in Him should not perish, but have eternal live." For I consider that the sufferings of this present time are not worthy to be compared with the glory that is to be revealed to us. For the anxious longing of the creation waits eagerly for the revealing of the sons of God. For the creation was subjected to futility, not of its own will, but because of Him who subjected it, in hope that the creation itself also will be set free from its slavery to corruption into the freedom of the glory of the children of God. For we know that the whole creation groans and suffers the pains of childbirth together until now. And not only this, but also we ourselves, having the first fruits of the Spirit, even we ourselves groan within ourselves, waiting eagerly for our adoption as sons, the redemption of our body. For in hope we have been saved, but hope that is seen is not hope; for why does one also hope for what he sees? But if we hope for what we do not see, with perseverance we wait eagerly for it. And in the same way the Spirit also helps our weakness; for we do not know how to pray as we should, but the Spirit Himself intercedes for us with groanings too deep for words; and He who searches the hearts knows what the mind of the Spirit is, because He intercedes for the saints according to the will of God. And we know that God causes all things to work together for good to those who love God, to those who are called according to His purpose. For whom He foreknew, He also predestined to become conformed to the image of His Son, that He might be the first-born among many brethren; and whom He predestined, these He also called; and whom He called, these He also justified; and whom He justified, these He also glorified. What then shall we say to these things? If God is for us, who is against us? I, THEREFORE, the prisoner of the Lord, entreat you to walk in a manner worthy of the calling with which you have been called, with all humility and gentleness, with patience, showing forbearance to one another in love, being diligent to preserve the unity of the Spirit in the bond of peace. There is one body and one Spirit, just as also you were called in one hope of your calling; one Lord, one faith, one baptism, one God and Father of all who is over all and through all and in all. But to each one of us grace was given according to the measure of Christ's gift. Therefore it says, "WHEN HE ASCENDED ON HIGH, HE LED CAPTIVE A HOST OF CAPTIVES, AND HE GAVE GIFTS TO MEN." (Now this expression, "He ascended, " what does it mean except that He also had descended into the lower parts of the earth? He who descended is Himself also He who ascended far above all the heavens, that He might fill all things.) And He gave some as apostles, and some as prophets, and some as evangelists, and some as pastors and teachers, for the equipping of the saints for the work of service, to the buiilding up of the body of Christ; until we all attain to the unity of the faith, and of the knowledge of the Son of God, to a mature man, to the measure of the stature which belongs to the fulness of Christ. As a result, we are no longer to be children, tossed here and there by waves, and carried about by every wind of doctrine, by the trickery of men, by craftiness in deceitful scheming; but speaking the truth in love, we are to grow up in all aspects into Him, who is the head, even Christ, from whom the whole body, being fitted and held together by that which every joint supplies, according to the proper working of each individual part, causes the growth of the body for the building up of itself in love. THEREFORE be imitators of God, as beloved children; and walk in love, just as Christ also loved you, and gave Himself up for us, an offering and a sacrifice to God as a fragrant aroma. And He is the image of the invisible God, the first-born of all creation. For by Him all things were created, both in the heavens and on earth, visible and invisible, whether thrones or dominions or rulers or authorities-- all things have been created by Him and for Him. And He is before all things, and in Him all things hold together. He is also head of the body, the church; and He is the beginning, the first-born from the dead; so that He Himself might come to have first place in everything. "SEE OTHERS AS GOD SEES YOU." together in My name, there I am in their midst." From whom was the whole earth populated? Crochet 'N' More website after the next issue is sent out. 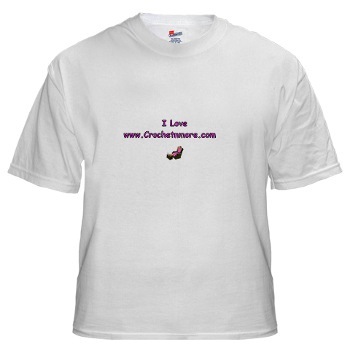 Check out all of our free crochet patterns. For any project that requires a foundation row of all double crochets you can use Foundation Double Crochets. In other words, instead of making a series of chain stitches and then working a double crochet into each chain you work a series of FDC stitches. To begin a Foundation Double Crochet row, Chain 4.
to finish the foundation double crochet. Repeat from the asterisk * for as many stitches as you need for your project. "On-line encyclopedia of knitting and crochet facts"
Keep a small notebook or a few index cards and a pen or pencil in your crochet bag. You will be prepared if you need to make notes in order to keep track of rows in your pattern. Scrap Yarn Ideas ... do you have number 90? If you have a use that's not listed email me! Leave your message in our guestbook... and it may appear in an issue of the CNM Newsletter! Dc in next 20 dc, dec over next 2 dc (*yo,insert hk in next st, yo, draw through 2 lps. Rep from*once more. (3 lps on hk) yo, draw through all 3 lps ) Dc in last 21 dc. Ch 3, turn. For that instruction you work one double crochet in each of the next 20 double crochet stitches. 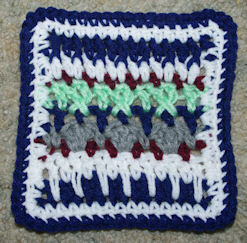 Then decrease over two double crochets using the instructions within the brackets. Then double crochet in each of the last 21 double crochet stitches. Make 3 chains and turn. 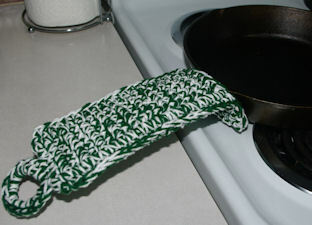 I am in the process of uploading a series of videos demonstrating how to make the dish towel topper pattern. Once I have them all uploaded I will add links to the pattern page. FPtr in stitch 2 below each of next 4 hdc (opposite side of foundation ch). I know how to do the FPtr stitch, I just don't know how to start it in the stitch they want me to. 6 and is the hat called " tangerine dream. Thank you in advance for any help you can provide me. I am a novice crocheted. I'm not familiar with this pattern but I believe I know what the designer wants you to do. I believe the instruction to work the FPtr in a stitch 2 below... means to work the front post treble into each of the next four stitches "two rows below"... meaning two rows down from the normal working row. So in this case, instead of working the front post treble into each of the next four stitches on the current row... count down two more rows and work into the stitches on Row 1. The part that is confusing to me is (opposite side of foundation chain). Not sure what they mean by that since post stitches are worked "around" the post of existing stitches... not into any chains. I love your web site and thank you for all the patterns and tips! I love to crochet. 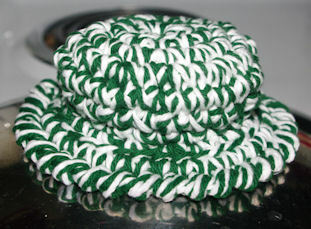 I want to try the basketweave dishcloth. The pattern looks good but I have a question....it says nothing about turning or chains at the end of the rows. After row 1, do I just turn it and slip stitch with out any chains? I was going to try that. With the FPDC and BPDC I wonder if that what makes the height without chains but I would love it if you would confirm that. You’re very welcome Julie... glad you enjoy what CNM has to offer. chains that is what makes the first post stitch for the row. 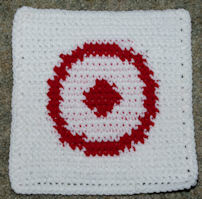 How are you attaching the cc & carrying the colors along to the next stitch & to the next row. Are you using stitch holders? I do not use any stitch holders and I carry the unused color as I crochet. Color changes are the same in all of my row count patterns. Good morning =) my name is Jennifer Dellagatta. I just recently finished the butterfly square that you provide and im currently working on the peace sign. Your patterns are amazing. Thank you for them. Easy to read and easy to use. Again thank you. Have a great day. Scps is a Single Crochet Puff Stitch. push puff to front of work, work next stitch in your pattern. HI!! I just completed this for my Yorkie a few min ago, and wanted to thank you for the pattern. I made it match a hair bow I made for her the other day. She looks adorable!! She's about 9#s, so I needed it to be a bit smaller. I started with 21 chains, then did approx 9rows for the collar tube. For the triangle part, I decreased using sc2tog at the beginning and end of each row. (I didn't do the rows with the same amount of sc at all). It worked out great!! I plan on making her many more sets... She is so spoiled!! Again, thank you so much for sharing this great pattern with us!! I just wanted to thank you for sharing this pattern. It is exactly what I have been looking for. I love the fact that you use double crochet and not all single crochet. Single crochet, for me at least, can be quite boring. It's both pretty AND practical. The information provided below is strictly for your enjoyment. If you know of any current contests or giveaways email me. Looking for a particular item to buy? Get Your Home In Order! This book is a wonderful addition to any crochet library. I've had numerous requests over the years of what to crochet for boys. 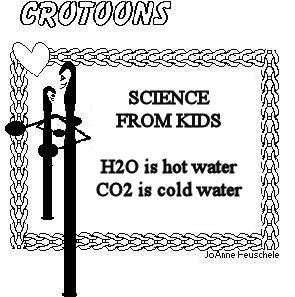 Crobots are definitely the answer! crochet stitches, assembly stitches and other embellishments used in the patterns. The patterns are well written, some of the book is written in a small font but the pictures are wonderful. NOTE: This book comes to you with a safety warning regarding the small parts used in the patterns. Therefore, please use your own discretion as to the age of the child you intend the gift for. Little Johnny comes home from his first day at school. His Mother asks, "Well, what did you learn today?" The little boy came home from his first day at Sunday School. He told his mother that his Sunday school teacher was Jesus' granny. "How did you find that out?" his mother asked. "Well, she never stops talking about Jesus," he replied. the door and conversation turned into uneasy whispering. of them asked me where the phone was. overhear what the biker said into the receiver. "Hi, Mom. Just want to let you know I'll be home late tonight." "Sure was a lot of 'em, huh sir?" A distraught senior citizen phoned her doctor's office. "Is it true," she wanted to know, "that the medication you prescribed has to be taken for the rest of my life?" "'Yes, I'm afraid so,"' the doctor told her. because this prescription is marked 'NO REFILLS'.."
sure enough, it was lost. cap, he might be able to find one that fit. Sure enough, he hadn't been searching long when he found a gas cap. He tried it on, and it went into place with a satisfying click. that fits. And this one's even better because it locks..."
forward to sampling seafood from the Pacific Ocean. "Is it fresh?" I asked the waitress. While sports fishing off the Florida coast, a tourist capsized his boat. He could swim, but his fear of alligators kept him clinging to the overturned craft. Spotting an old beachcomber standing on the shore, the tourist shouted, "Are there any gators around here?" "Naw," the man hollered back, "they ain't been around for years!" Feeling safe, the tourist started swimming leisurely toward the shore. When he was almost there, he asked the guy, "How'd you get rid of the gators?" "We didn't do nothin'," the beachcomber said. "The sharks got 'em." Jack decided to buy Beth a new car for her birthday. saying she didn't want the car. She wouldn't even talk about it! liked that car. What changed your mind about it?" answered. "It's bad enough having that on my clothing." “You know Father, I am really stuck in a quandary. My boss was complaining in a staff meeting the other day that he wasn't getting any respect. Later that morning he went out and got a small sign that read, "I'm the Boss." He then taped it to his office door. Later that day when he returned from lunch, he found that someone had taped a note to the sign that said: "Your wife called, she wants you to bring her sign back!" "We haven't had any for awhile and I doubt we'll be getting any soon." week. After she left, I read the salesgirl the riot act. next week. Now, was she looking for, a Barbi?" "Well, what was it she said she wanted?"